Norfolk Island, located 1676 km northeast of Sydney (Australia), is an island of volcanic nature (basaltic lava flows), having neighboring southern shore two smaller islands, uninhabited, Philip (also volcanic max altitude. 275 m) and Nepean (limestone). Norfolk Island is relatively rugged topography, with an average altitude of approx. 110 m and two ridges that cross the 300 m (318 m Mount Pitt, Mount Bates 319 m). 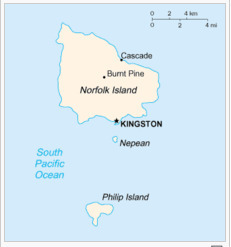 Except for a few areas, including Kingston (south) and Cascade (north) coast of the island is dominated by rocky abrubturi. -Oceanic subtropical climate, with average annual temperature of 15 degrees and rainfall exceeding 1300mm/an. Frequent typhoons, especially in the period's. Varied vegetation stands Norfolk pine (Araucaria a variant), which can reach heights of 60 m and a diameter of 3 m and fauna of bats, seabirds and turtles. Norfolk Island (Norfolk Island English, norfuk: Norfuk Ailen) is an island in the southwestern Pacific Ocean, Australian territory. Most of the inhabitants are descendants of the Bounty rebels, moved here in 1856, on Pitcairn Island. The administrative center is the city of Kingston (about 1000 inhabitants). Discovered by James Cook in 1774, the island is British penal colony between 1788-1814 and 1825-1855. It was abandoned in 1855 because a year later to be repopulated with 194 emigrants from Pitcairn Island. It is administered as a separate colony until 1897, when he became the dependencies of the Australian state of New South Wales. Since 1913, the Australian government took control of the islands, the population has repeatedly expressed a desire for self-government. Norfolk Island Act of 1979, the Australian government maintains authority over the islands, but sets the legislative and executive powers own island. Legal provisions of 1985 and 1988 come to expand the power of local bodies. According to the Law of 1979, the territory is headed by a Director appointed by the Governor-General of Australia, acting taking into account the recommendations of the Executive Council. Legislative power is exercised by the Legislative Assembly, consists of 9 members, elected by universal suffrage for a term of 3 years.